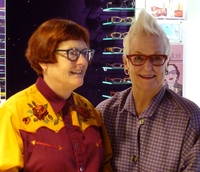 L.A. Eyeworks existe depuis 1979, sous l'impulsion de Gai Gherardi (la dame avec la houpe, à droite >) et son amie Barbara McReynolds. Elles ont mis toute leur passion pour les beaux produits et leur attention pour les gens qui sont amenés à porter des lunettes dans leur création. Et cela se sent. Confort, matériaux légers et durables. Arc-en-ciel de couleurs chatoyantes et recherchées. Mais pas seulement. Des lunettes faites pour les visages, les physionomies les plus diverses. Afin de souligner l'intérêt et la qualité des traits. Mais oui ! Gai raconte souvent cette anecdote : l'un de ses clients, chauve, achète une nouvelle paire de L.A. Eyeworks. Quelques jours après, il appelle Gai pour lui dire : incroyable, on ne voit plus ma calvitie. Magique vous dites ? 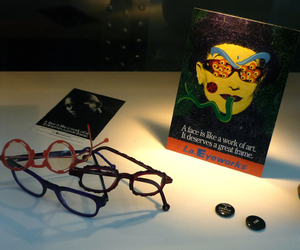 L.A.Eyeworks has been creating original, invigorating eyeglasses since 1979. Designed by the company’s co-owners, Gai Gherardi and Barbara McReynolds, the iconoclastic glasses have changed the way people think about eyewear. L.A.Eyeworks’ designs are immediately recognizable for their modern strokes and bold color innovations, infiltrating the popular culture landscape in everything from art to movies. 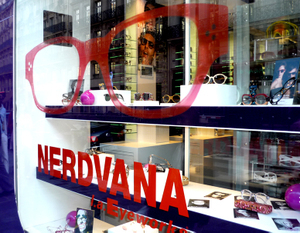 Hand-designed and hand-made, the frames provoke personality and identity. Gai and Barb' met in high school in Huntington Beach, California. Immediately inseparable, they found they had innumerable traits in common, including a deep love of eyewear. After a decade of assorted jobs in the optical business (and lots of hi-jinks on the side) the two decided to open their own store, in a revolutionary gallery style, on then-quiet Melrose Avenue in 1979. Realizing they couldn’t find the types of glasses they wanted to sell, Gherardi and McReynolds began to design the L.A.Eyeworks collection. Their first frame, “The Beat,” was inspired by a classic chunky plastic frame, but the duo made it contemporary with over twenty-two outrageous colors. The frames were further customized with hand-drilling, sandblasting, and unique applications of materials. The intent was always to question prevailing notions of fashion and to accentuate personality.